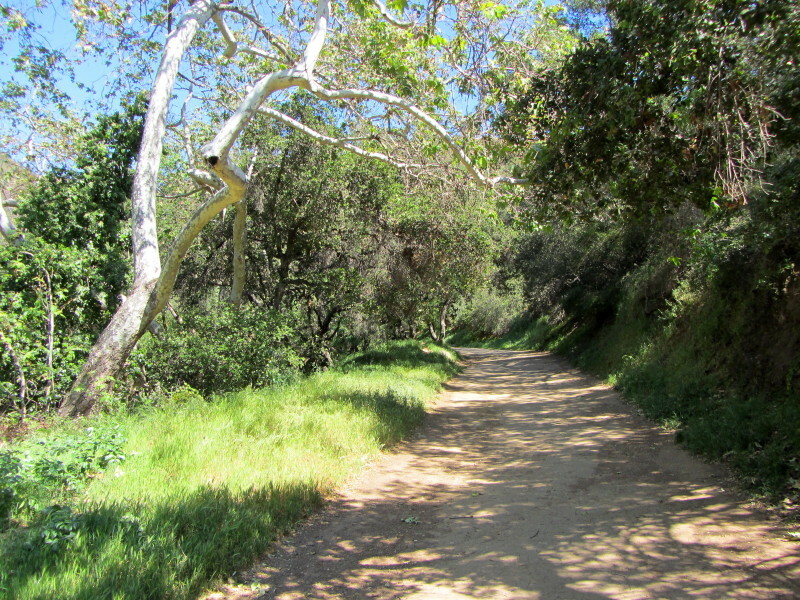 Brush Canyon is the largest watershed in Griffith Park. The canyon lies in the southwest section of the park and is relatively undeveloped and is less crowded than other areas of the park. It has not burned in years so the vegetation is mature and thick. The canyon bottom is lined with a dense canopy of sycamores, oaks, and alders. The slopes are blanketed with thick chaparral. Three of the park's prominent peaks crown Brush Canyon's ridgeline: Mt. Chapel and Mt. Bell to the north, and Mt. Hollywood to the east. 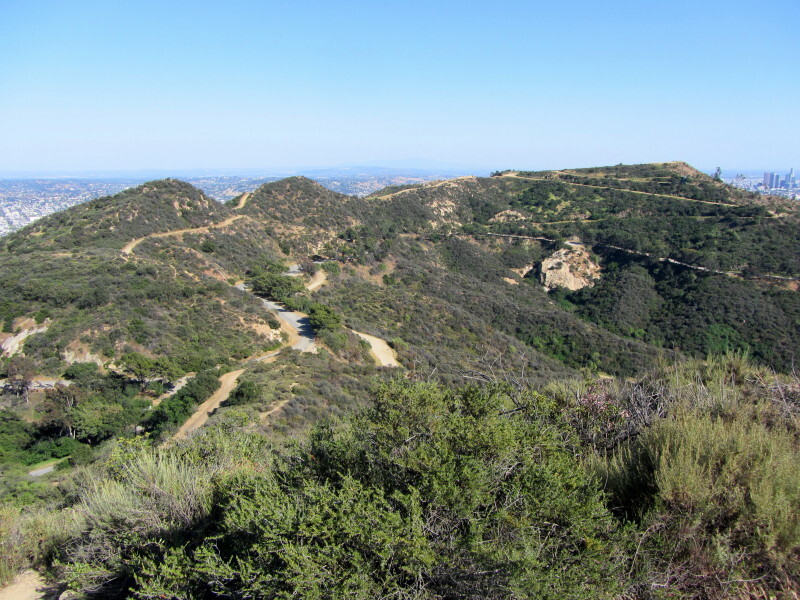 The name "Brush Canyon" dates back to at least 1900, where it appears as one of only two named features (along with Cahuenga Peak) on the USGS topo map of the area that is now Griffith Park. At the lower end of the canyon lie the famous Bronson Caves (aka Batcave) which have been seen in countless films and television shows. 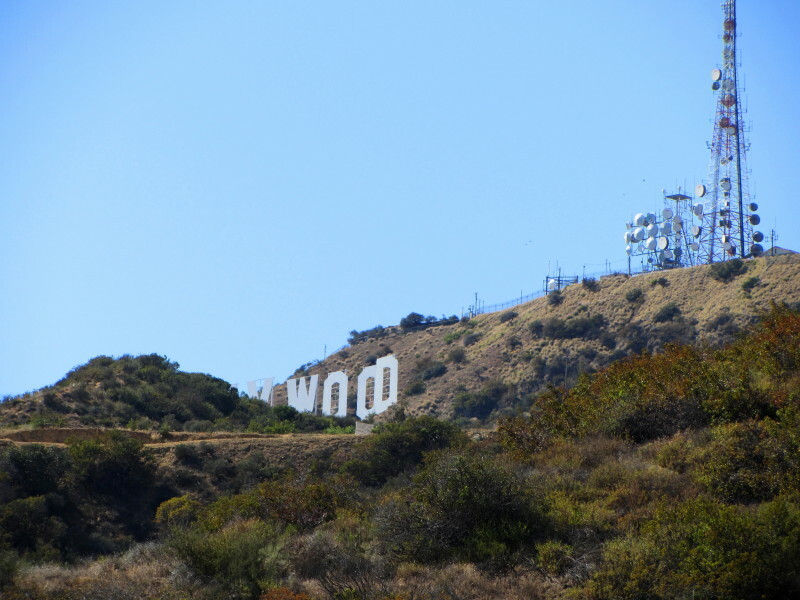 The short walk to this Hollywood landmark can be done as an easy outing for the entire family or can be incorporated into longer, more strenuous hikes. A network of routes provides a variety of hike possibilities. 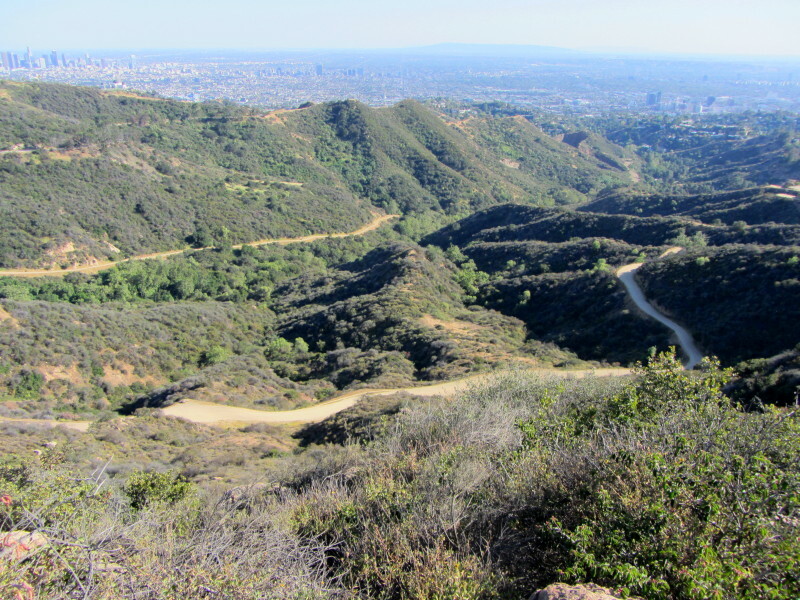 A wide dirt roadBrush Canyon Trailruns north up through the canyon 1.1 mile to intersect Mulholland Trail, which runs from Mt. Lee Drive on the west to Mt. Hollywood Drive on the east. And several well-established use trails add to the web of possibilities. From this trail system you can reach one or more of the immediate surrounding peaks and also reach other popular destinations such as Mt. 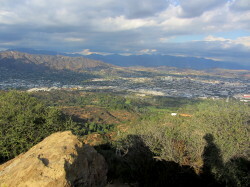 Lee (the Hollywood sign), Captain's Roost, Dante's View, and Bronson Caves. Even Griffith Observatory can be incorporated into a hike from Brush Canyon. My main hike description below details the hike to Mt. Bell via Brush Canyon. 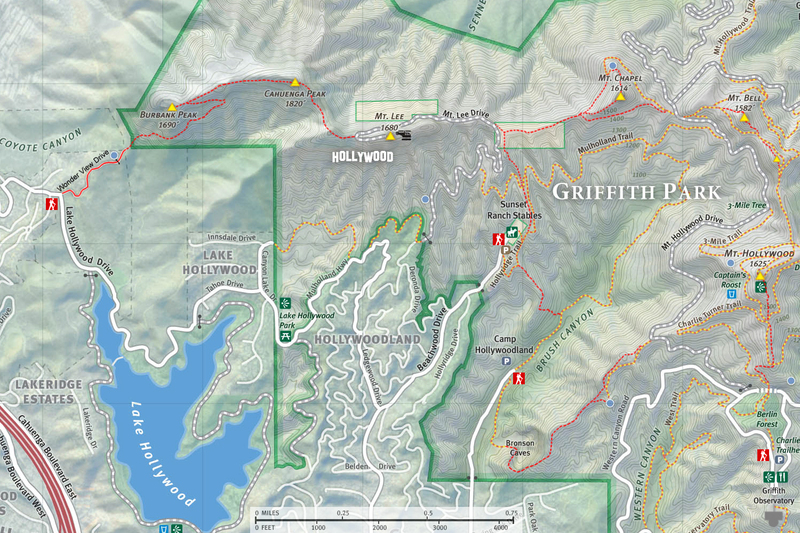 Following that I include write-ups for various alternate routes and destinations from Brush Canyon along with links to other hike descriptions and blog posts of various hikes I have done. You'll find plenty of ingredients to hike a stock route or create your own custom hike. In Hollywood, navigate your way to the intersection of Franklin Avenue (which is one block north of Hollywood Blvd.) and N. Canyon Avenue (which is 0.3 mile east of Gower Street and 0.4 mile west of Western Avenue). From the 101 Freeway, exit at Gower. 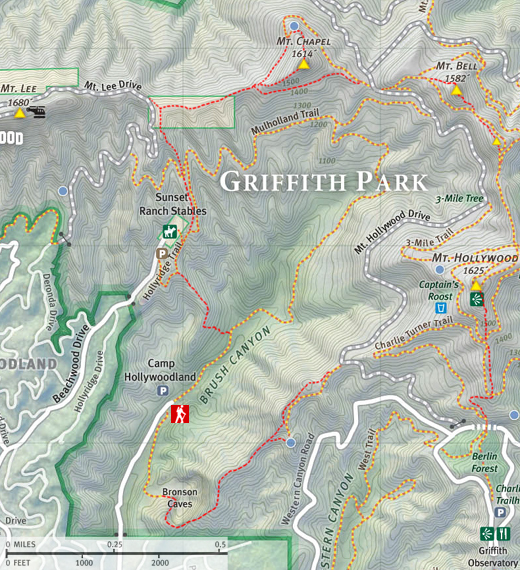 Drive north on N. Canyon Ave. At 1.0 mile pass through the gate into Griffith Park and in another 0.4 mile arrive at a small parking lot on the left with 14 parking spaces. Park here (if there are no places available, drive back 0.15 mile and park in the large area alongside the road). NOTE: The park gate is locked at sunset. From the small parking lot, walk north past the locked vehicle gate on the wide road (which is a continuation of Canyon Drive). Briefly enjoy a forest of majestic sycamores and oaks nourished by the seasonal creek. Within minutes you will pass a flood control dam on your right. Directly across from the dam on the left side of the road is a non-descript use path that climbs the steep mountainside as an alternate route for various hike possibilities (see alternate routes below). Soon the road bends right (east) and crosses the creek. Enjoy a little more shade before the trail bends north and begins its ascent along the canyon’s eastern slopes. En route you are treated to glimpses of Captain's Roost and Mt. Hollywood high to the east and Mt. Lee and Hollywood sign to west. At the head of the canyon, Mt. Chapel (on the left) and Mt. 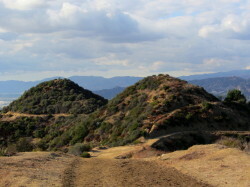 Bell (on the right) dominate the northern view with Mulholland Trail slicing across Mt. Chapel's flank. The canyon bottom below on the left hosts a thick canopy of sycamore and oak, which can display rich colors in the autumn. 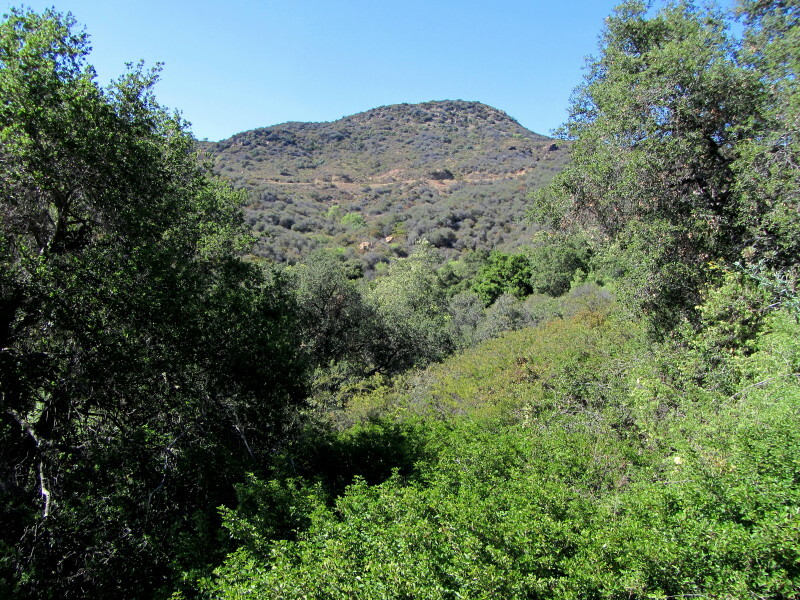 The surrounding hillsides are covered with dense chaparral—a plant community dominated by short, shrubby plants. In the spring, wildflowers grace the scenery. At 0.8 mile, a bend in the road crosses a small tributary canyon coming in from the east. There is a use path that disappears into the brush up canyon. This informal route terminates atop the huge granite outcropping alongside Mt. Hollywood Drive, 250 vertical feet above. The route can get dicey with thorny brush, stinging nettle, poison oak, and some precipitously steep, lose sections climbing the outcrop. I do not recommend it as a route. Continue on the road as it contours now in a westerly direction. 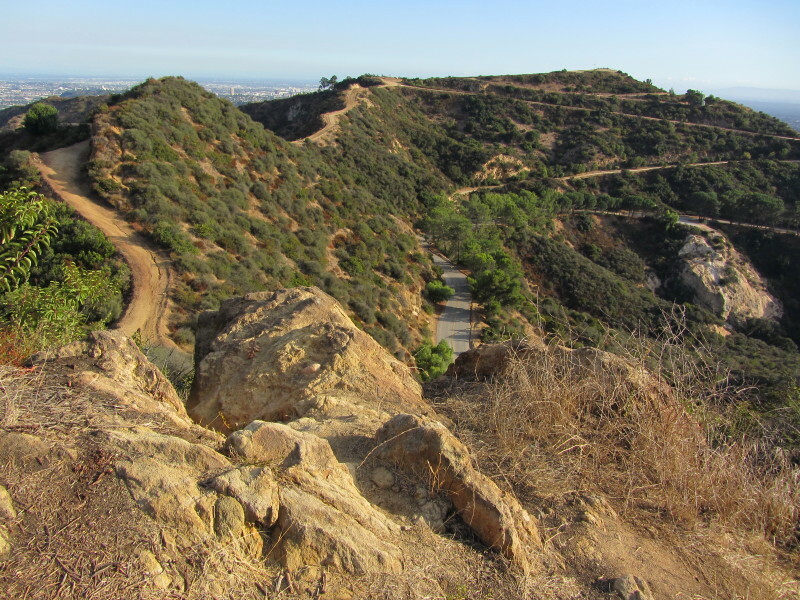 You'll pass a splendid overlook, and in another 90 yards, you arrive at a three-point junction with Mulholland Trail, 1.1 miles from the start. Turning left (west) would take you to Hollyridge Trail (0.56 mile), Mt. Lee Dr. (0.88 mile), and to Mt. Lee (1.71 miles) and beyond. This could also be a return route if you climb Mt. Chapel as part of a loop. But for this present hike to Mt. Bell, turn right (east) on Mulholland Trail. Procedure 0.3 mile to the Mulholland Trail / Mt. Hollywood Drive junction. Take a sharp left (northwest) onto the paved road and in about 130 yards veer right onto the dirt path. In another 80 yards take a sharp right heading east (left takes you to Mt. Hollywood Dr. and would be a route you would take if you were hiking from Mt. Bell to Mt. Chapel). Another 135 yards brings you to a three-point junction at a saddle west of Mt. Bell. Turning left (north) would take you to various trails in the northeast section of the park. East approach - This is probably the easiest. From the saddle west of Mt. Bell, continue east on the road as it ascends traversing the north flank of Mt. Bell. In about 70 yards, notice a narrow path on the left. This is the southwest approach to Mt. Bell’s summit. Continue on the road for another several minutes until you reach a saddle east of Mt. Bell (0.15 mile from the saddle west of Mt. Bell). Turn left and climb the narrow path scrambling about 130 yards to the summit. The trail is a little steep and slippery in spots and you may need the assistance of your hands in climbing up some rocks near the top. Southwest approach - From the saddle west of Mt. Bell, continue east on the road as it ascends traversing the north flank of Mt. Bell. In about 70 yards, notice a narrow path on the left. This is your route scrambling about 125 yards to the summit. It is a little steep and slippery in places and you may need to carefully use branches to assist your climb. Northwest approach - This is the most difficult route. I don't recommend it unless you are an adventurer with navigational intuition and off-trail experience. From the saddle west of Mt. Bell, continue east on the road as it ascends traversing the north flank of Mt. Bell. Almost immediately notice a narrow path on the left. It starts out nicely but then it offers a web of routes, some of which are more difficult than others. Choose wisely as you meander to the summit. There are some places that are steep with loose footing, and you may need the assistance of your hands in spots. The pointed summit of Mt. 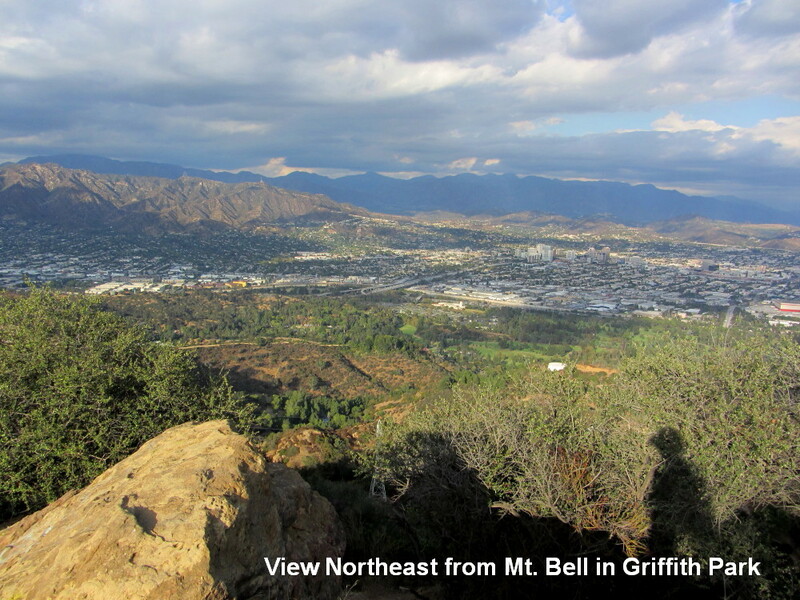 Bell rewards you with a superb perch and fine views over the central core of Griffith Park and beyond. You have a good bird’s eye view down on the east end of the park. To the north and east the human sprawl of Burbank and Glendale blanket the valley while the Verdugo and San Gabriel mountains rise majestically into the sky. The west view is dominated by Mt. Chapel with Mt. Lee and Cahuenga Peak poking up behind. To the south you look down the throat of Brush Canyon and the wide road from whence you came, with Mt. Hollywood rising above. The vast L.A. metropolis paints your southern panorama with the Pacific Ocean as the horizon. On a clear day on can see all the way to Catalina Island. The din of traffic on the 134 Freeway is ever present. You are most likely to enjoy some solitude here since few park users stray off the wide dirt roads. Return the way you came or consider visits to surrounding peaks and/or other return routes. Mt. Bell's nearest neighbor to the east is officially unnamed, but its prominent stature calls for a name. I dub it Baby Bell. From the saddle east of Mt. Bell, continue southeast on the dirt road that ascends across the north flank of Baby Bell. In 50 yards, notice a path veering to the right. Scramble up this path 100 yards to the summit of Baby Bell. An octagonal concrete pad caps the peak. Your panorama of the east end of the park is particularly rewarding. Return the way you came. Or continue on to Mt. Hollywood (see below for a description). Approach from Mt. Bell - From the saddle east of Mt. Bell, continue southeast on the dirt road that ascends across the north flank of Baby Bell. In 50 yards, notice a path veering to the right. You can scramble up this path about 100 yards to the summit of Baby Bell and then continue south down the steep route about 100 yards to meet the trail coming around Baby Bell. Or you continue up the road as it ascends southeast across the north flank of Baby Bell and ends at a hip in 150 yards. The route turns right (south) becoming a narrow path. Descend this trail and in 120 yards you arrive at a dirt road. Continue straight (south) on the road as it follows the ridge 0.2 mile to a four-point junction on the north side of Mt. Hollywood. To the right (west) is 3-Mile Trail, an alternate route for your return. To the left (east) is Hogback Trail (East Ridge Trail), which can take you 125 yards to Dante’s View. For now, continue straight (south) following the dirt road 0.18 mile to the summit of Mt. Hollywood (1625'). Return the way you came. Or at the four-point junction, turn left (west) on 3-Mile Trail and descend 0.6 mile to paved Mt. Hollywood Drive. 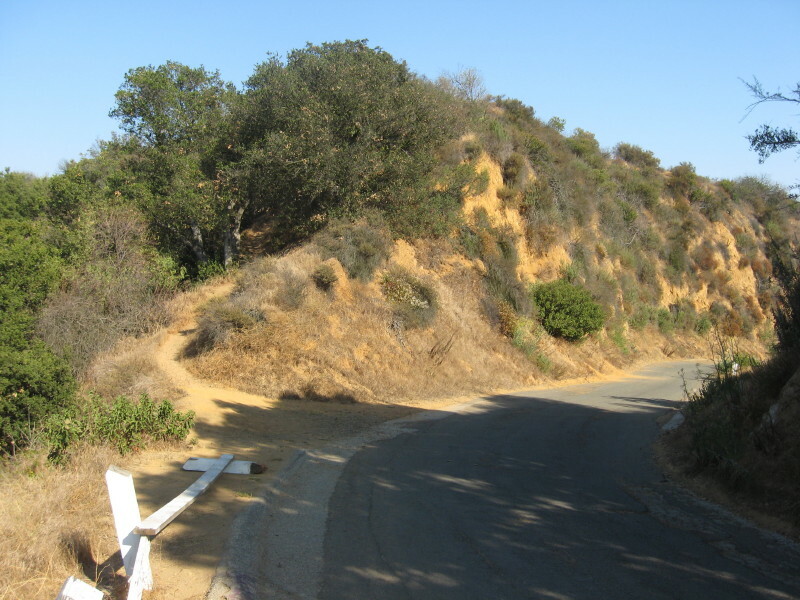 Turn right (north) and walk 0.26 mile to the Mulholland Trail / Mt. Hollywood Drive junction. 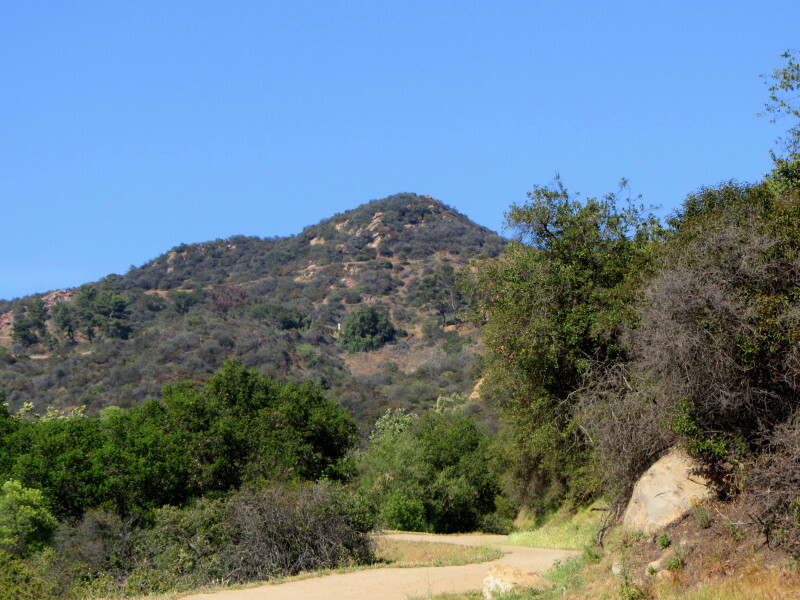 Turn left and retrace your steps on Mulholland Trail and Brush Canyon Trail to the trailhead. Approach from 3-Mile Trail - If you would like to take more direct approach to Mt. Hollywood from Brush Canyon, either as an out-and-back, or as a loop hitting Mt. Hollywood first then continuing to Mt. Bell, this is a good route. From the Mulholland Trail / Mt. Hollywood Drive junction, go south on the paved Mt. Hollywood Drive and walk 0.26 mile to 3-Mile Trail on the left. Veer left unto the dirt road and walk 0.6 mile to a four-point junction on the north side of Mt. Hollywood. Turn right (south) and follow the dirt road 0.18 mile to the summit of Mt. Hollywood (1625'). The summit of Mt. Chapel offers a splendid 360-degree panorama of the heart of Griffith Park and the human sprawl beyond. The view west is dominated by Mt. Lee (with the communication towers) and Cahuenga Peak. To the east, Mt. Bell (left), Baby Bell, and Mt. Hollywood define the near horizon. To the north lie Burbank, North Hollywood, and the San Fernando Valley. To the south beyond the rugged parkland lies the massive Los Angeles Basin. On a clear day you can see all the way to the Pacific Ocean and Catalina Island. North Approach - This is easiest route and uses a dirt road and a short use path. From the Mulholland Trail / Mt. Hollywood Drive junction, take a sharp left (northwest) onto the paved road. Walk 0.17 mile and notice a dirt road on the left (the dirt road on the right heads to Mt. Bell) (the paved road bends north and in about 50 yards splits). Veer left (west) unto dirt road. Mt. Chapel looms ahead. In about 50 yards notice a narrow path heading up the slope on the left. This is a connector route to Mulholland Ridge Trail and to two other approaches to Mt. Chapel (see Southwest Approach and Climber’s Route below). But for this current hike, stay on the dirt road as it ascends and traverses the north flank of Mt. Chapel. You are treated to some striking views north over the San Fernando Valley. You’ll pass below water tank 153 and reach a hip with a view west, 0.25 mile from Mt. Hollywood Drive. The dirt road takes a sharp left (south) and in another 65 yards ends at the water tank. (Notice a narrow trail descending south across the western flank of Mt. Chapel. 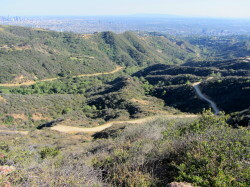 This route connects to Mulholland Ridge Trail and could be used for alternate ways back or to extend the hike to Mt. Lee and beyond.) Turn left, walk past the right side of the water tank and notice the narrow path on the right heading south up the slope. Scramble up this path about 100 yards to the summit. Return the way you came or consider descending the southwest approach for a loop. Southwest Approach - This narrow path connects the summit of Mt. Chapel with Mulholland Ridge Trail. From the Mulholland Trail / Mt. Hollywood Drive junction, take a sharp left (northwest) onto the paved road. Walk 0.17 mile to a dirt road on the left (west). Walk up that road about 50 yards and notice a narrow path heading up the slope on the left. Take this trail that immediately archives the ridge. Veer right (west) and walk up the ridge 140 yards to a “Y” junction. To the right is the steep climber’s path ascending the east ridge of Mt. Chapel (see Climber’s Route below). Veer left at the fork and follow the nice footpath as it gently climbs west across the south flank of Mt. Chapel. You’ll have great views south into the heart of Brush Canyon. At 0.26 mile from the “Y” junction you reach the junction of Mulholland Ridge and the southwest ridge route to Mt. Chapel. To climb Mt. Chapel, take a sharp right and ascend the narrow path 0.18 mile to the summit. There are a couple steep, rocky sections that require vigilance. To continue to Mt. Lee, see below. Climber's Route - This narrow, steep path climbs the east ridge and face of Mt. Chapel. The top section of this informal route is quite steep with loose footing and is somewhat precarious. It requires the use of hands in some places. I do not recommend this route unless you are an experienced hiker with off-trail skills. You can ascend this route by following the description to the “Y” junction above. Via Brush Canyon and Mt. 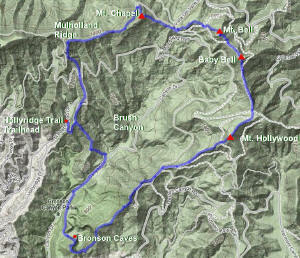 Chapel - Navigate to the junction of Mulholland Ridge and the southwest ridge route to Mt. Chapel (see description above). Continue west on the narrow trail along the undulating ridgeline. Enjoy great views both north and south. Just shy of the paved Mt. Lee Drive the trail splits. The left takes you a few steps to a knob culminating a ridge ascending from Mulholland Trail and Hollyridge Trail. The path on this ridge can be used as an alternate return route to Brush Canyon. But to continue to Mt. Lee, veer right at the split and continue another 60 yards to Mt. Lee Drive. Bear right on the paved road and walk 0.5 mile to the summit of Mt. Lee. 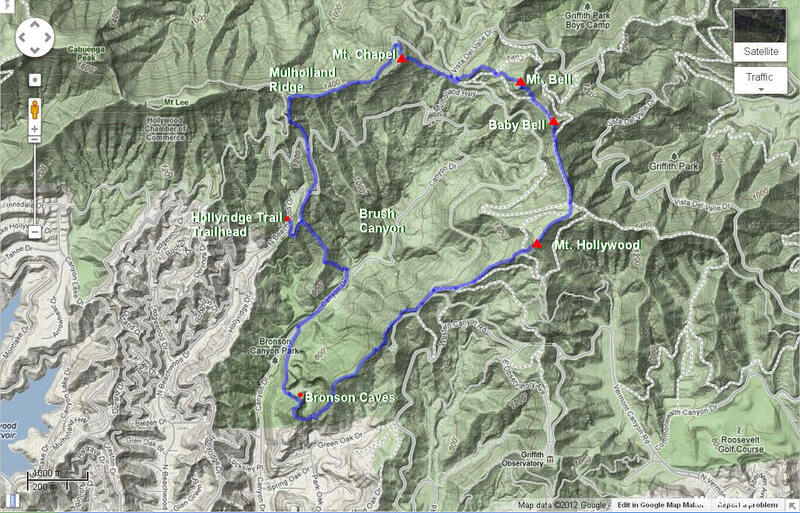 Via Brush Canyon and Mulholland Trail - If you would like to climb Mt. Lee from Brush Canyon either as an out-and-back (5.6 miles r.t), or as a loop hitting Mt. Lee first then backtracking and continuing to Mt. Chapel, Mt. Bell, and Mt. Hollywood, this is a good route. 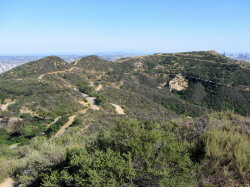 From the Brush Canyon trailhead, follow Brush Canyon Trail (a wide dirt road) north to a three-point junction with Mulholland Trail, 1.1 miles from the start. Turn left (west) and walk the wide dirt road as it contours the south slopes of Mt. Chapel and the head of Brush Canyon. At 0.56 mile you reach the junction with Hollyridge Trail ascending from the south. Bear right and continue up the road. In 50 yards as the road rounds an outward bend, notice a narrow path on the right climbing the ridge north. This is an alternate route to and from Mulholland Ridge. Continue on the road as it contours around the slopes, and in a few more minutes you will arrive at paved Mt. Lee Drive (0.32 mile from Hollyridge Trail junction). Turn right (north) and proceed up the windy road 0.33 mile to where the road achieves the ridge with views north. Notice on a right a narrow path heading east into the brush. This trail takes you to Mt. Chapel via Mulholland Ridge and connects with other park trails. But for our hike to Mt. Lee, bear left (west) on the road and walk 0.5 mile to the summit of Mt. Lee. 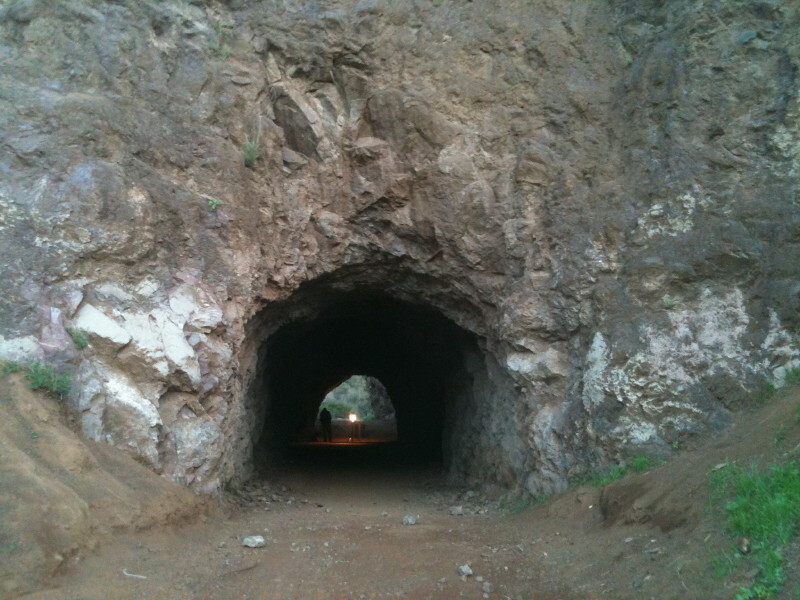 Tucked away in the southwest corner of Griffith Park sits the iconic Bronson Caves, also popularly called the Batcave. It was the location of the cave for the 1960s “Batman” television series. The caves have been used in hundreds of movies and television shows, including “Bonanza”, “Gunsmoke,” “The Lone Ranger,” “Little House on the Prairie,” “Fantasy Island,” “Mission Impossible,” “Star Trek: Voyager,” “The Scorpion King,” and many others. The “caves” are actually tunnels hewn out of solid granite in a quarry operation started in the first decade of the 1900s. Crushed rock mined from the hillsides formed the railbed for the Pacific Electric Transit System. Later the quarry provided rock for such roadways as Wilshire and Sunset boulevards. The mining ceased in the 1920s and soon film makers discovered this ideal location just minutes away from studios in Hollywood. To hike to the Batcave, turn right (south) from the small parking lot unto Canyon Drive and walk about 50 yards to the road junction on the left (east), bounded by high-banked red curbs. Turn left (east) and in about 30 yards the paved road bends right (south) and arrives at a locked vehicle gate. Pass by the gate unto a dirt road which gently ascends south paralleling Canyon Drive. 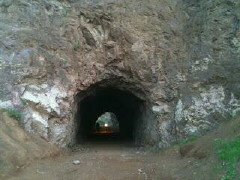 In a few minutes you curve left rounding a bend and come face to face with the famous tunnels, 0.3 mile from the start. After exploring the site, return the way you came. If you are an experienced adventurer with billy goat skills, you can climb the steep use path that begins on the right about 40 yards before you get to the mouth of the tunnel. The narrow route climbs up to and around the rim of the old quarry. It’s quite steep with loose footing in places and the sheer drop-offs along the rim demand vigilance for safety. The route follows the ridge all the way up to Mt. Hollywood Drive (see Around the Rim below for ideas of how this route can be incorporated with other hikes). Day Hikes Around Los Angeles - by Robert Stone (Day Hikes Books: Red Lodge, 2003). Hike 65: "Bronson Caves." Brief background and hike description. Hike 66: "Brush Canyon." Brief hike summary and description. He presents the possibility of extending the hike to Mt. Bell, but his description of it is vague and inaccurate (he says right instead of left on Mt. Hollywood Drive. His line map also reflects this error). He has corrected these issues in his 2012 book (see below). Day Hikes in the Santa Monica Mountains - by Robert Stone (Day Hikes Books: Red Lodge, 2012). Hike 12: "Brush Canyon to Mount Bell." Overview and trail description of a 3.3-mile round trip hike with 850 in elevation gain. He has corrected the problems that are in the 2003 book (above) and his description and line map are now accurate and reliable. Los Angeles County: A Day Hiker's Guide - by John McKinney (The Trailmaster: Santa Barbara, 2006). "Brush Canyon." Historical background and hike description for Bronson Caves, and trail description for a 4.5 mile round trip hike to Mt. Hollywood. His description from Mulholland Trail to Mt. Hollywood is somewhat vague and confusing. He mentions a water tower #52, which I don't think is there any longer. He provides no map. Afoot and Afield in Los Angeles County - by Jerry Schad (Wilderness Press: Berkley, 2000). Area B-6, Trip 4: "Mulholland Ridge." Trail description of a 3.9-mile hike ascending Brush Canyon Trail, heading west on Mulholland Trail, climbing a steep use path north to Mulholland Ridge, following a narrow trail east along the ridge and across the south flank of Mt. Chapel to Mt. Hollywood Drive, turning right on Mulholland trail, walking back west to Brush Canyon Trail to return. This page was last updated May 11, 2015.